Four-color process printed on Side 1 of 16pt C1S White Semi-Gloss stock. Coated with Aqueous Matte. H4 business card slits on left pocket. Four-color process inserts printed on 80lb C2S White Matte Text stock coated with Aqueous Matte. Collated. 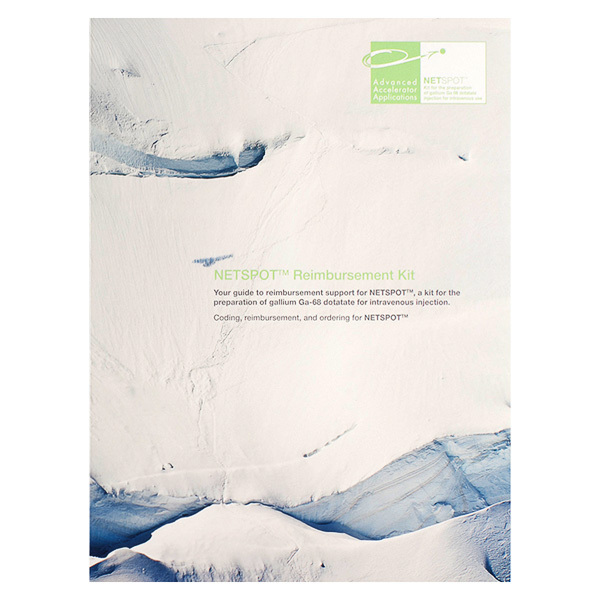 Snowy mountain peaks represent the potential of tumor diagnostic NETSPOT™. Green text adds the brand color for its creator, Advanced Accelerator Applications. Stepped inserts use green and gray to carry on the color scheme. Along with the back cover, they provide details about the new diagnostic. The mountain imagery present on each panel creates a consistent visual design. Four-color process printed on Side 1 of uncoated 80lb Warm White Felt stock. V4 business card slits on both pockets. 5" belly band printed with 3 foil stamped areas on uncoated 48lb Glamma Natural Clear Translucent stock. 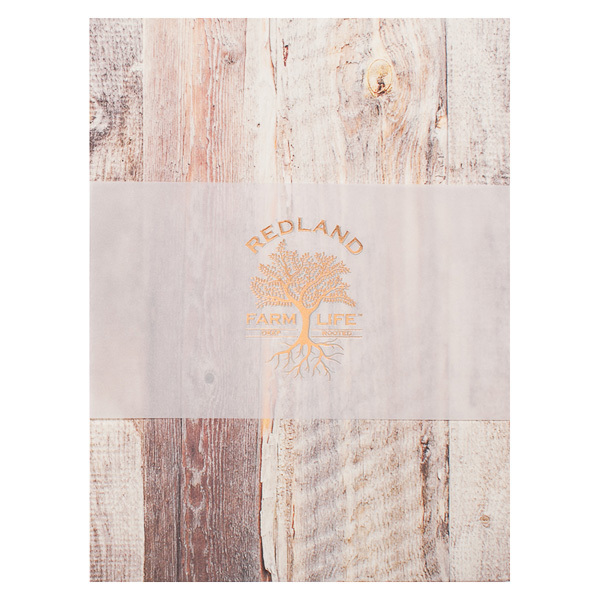 This design for Redland Farm Life captures the essence of the plant nursery's rustic country setting. Its wood grain panels mimic the look of a well-weathered barn. A five-inch wide belly band uses translucent stock. Its frosted color lends a touch of elegance to the design, as does the Metallic Copper foil stamped logo. The belly band wraps onto the two vertical pockets. The farm's name is printed in a stunning script typeface at left, while its tagline is located at right. Four-color process printed on Side 1 of 12pt C1S Semi-Gloss stock. Coated with Aqueous Gloss. 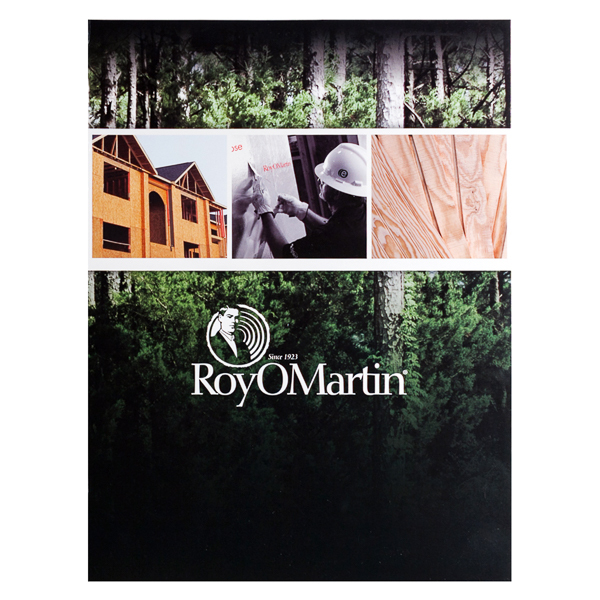 Pine forests and construction projects showcase both the source and uses of RoyOMartin's wood products. Inside, two vertical pockets provide the company's physical and social media contact information. A white bar across the back cover contains a statement about RoyOMartin's sustainable practices for eco-conscious clients. Four-color process printed on Side 1 of 16pt C1S Semi-Gloss stock. Coated with Aqueous Satin. H4 business card slits on both pockets. Cibo and Club Mousai share a location and this dual design. 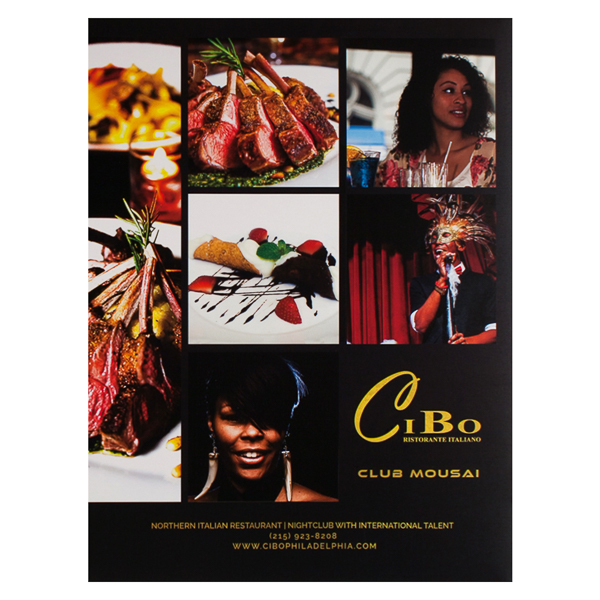 The photo collage showcases Cibo's authentic Italian cuisine and Club Mousai's vibrant nightlife. Black panels create a sophisticated evening look, especially when paired with gold typography. Black type on gold vertical pockets reverses the cover color palette while providing descriptions, logos, and contact information for the two businesses. A column of photos on the back showcases the venue's three main attractions: dinner, drinks, and dancing. Measuring 4" wide and 12" tall, two vertical pockets cover nearly half of their 8 1/2" x 11" contents for optimal protection without completely obscuring them. Both pockets are glued at the top and bottom, so papers can't slip out in either direction. Because of their tall, narrow shape, the pockets are good spots to include company information or a note to your customers, while the front and back covers offer ample room for your original imagery, brand name, and logo.